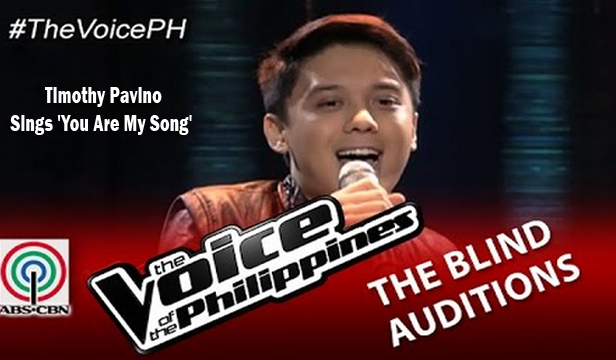 A 24-year old guy from Seattle in the person of Timothy Pavino was the first artist to enter the Blind Audition of The Voice of the Philippines Season 2. Timothy is a loving grandson who is responsible for taking care of his grandmother. When her grandmother experienced stroke, he never lose hope instead he did his best in order to bring back her “lola’s” strength. Timothy quoted “she is my father’s mother therefore I should take care of her.” Driven by his desire to reach his goals in life and to bring smile to his grandmother’s face, Timothy instead of going back to Seattle, decided to join the audition. Timothy chose the Martin Nievera hit “You Are My Song” for his audition performance hoping to make any of the judges turn his chair. It was obvious that Timothy felt a bit nervous before his performance but he managed to conquer his stage fright for the sake of good performance. He started with a soft and powerful voice, suitable for the genre of his chosen song. He instantly connected with the audience. A little more push on his performance and he was able to convince 3 of the coaches push the big, red button. The coaches namely Lea, Bamboo and Sarah who turned their chairs did their best to convince Timothy, but in the end, it was Coach Lea’s lucky day. Timothy was the first ever artist to be included on Coach Lea’s list of 14. He ran to his grandmother and hugged her with tears on his eyes.